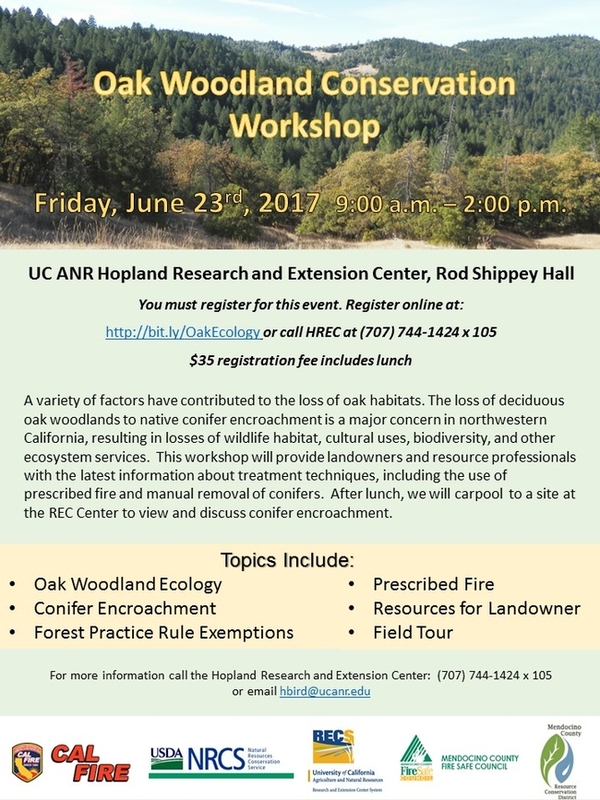 Fire has a vitally important role in the California landscape and many fire-related studies have been conducted at the UC Hopland Research and Extension Center (HREC) since 1951. 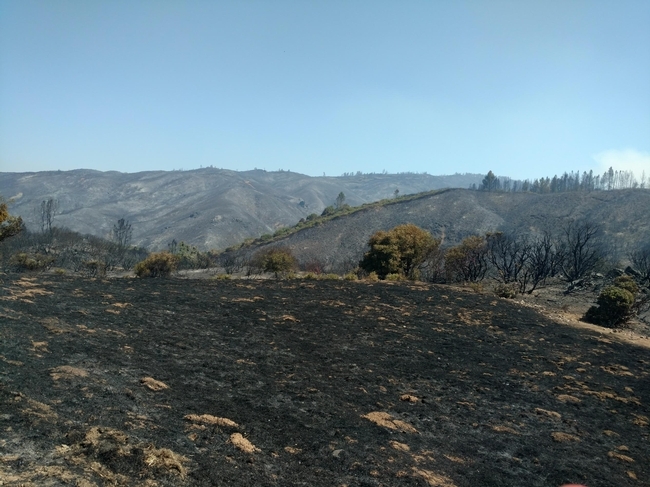 The majority of these fires have been prescribed burns, well controlled to manage invasive species and reduce fuel load, but on July 27 the staff had to deal with a very different kind of fire, as the River Fire swept across the site. Just a few short months ago, I enjoyed an afternoon with staff on site watching as CalFire conducted a prescribed burn to reduce invasive grass species and fuel load. The sight of the flames racing through the grasses was exciting and the skill of the CalFire team in controlling the fire inspired both respect and a feeling of safety – we were in good hands! The crews worked hard to protect some of the great oak trees we have on the site and to respect areas of cultural significance, including a rock inscribed with ancient petroglyphs. Tankers flew over sprinkling us with red fire retardant as they passed, allowing a new pilot some practice while keeping this burn well controlled. 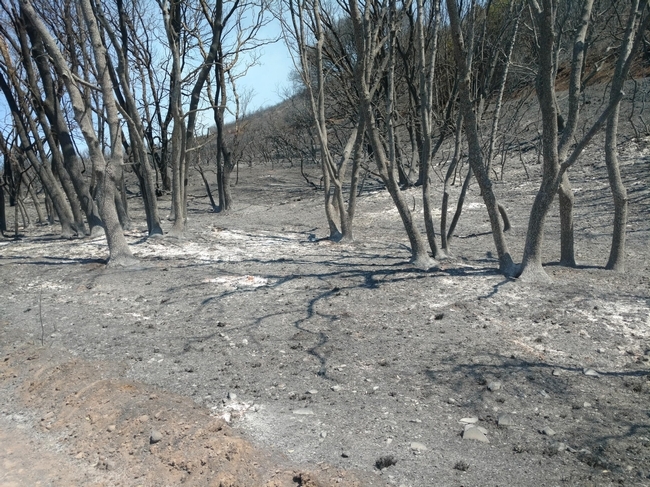 This burn inspired hope and in the space of just a month we were already seeing green shoots replacing the black of the burned areas, a new chance for the native grass species adapted to fire. How different an experience last week as a wildfire, the River Fire, began to burn close to our site on the afternoon of July 27. 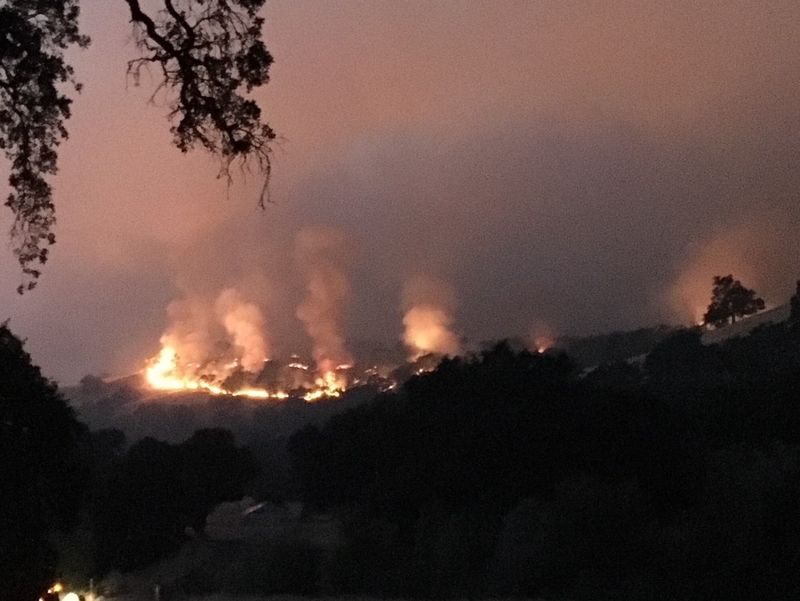 This fire was not under control, its power and size increasing so rapidly that by the afternoon it had spread to HREC and was quickly moving through oak woodland, grassland and chaparral. I'm very lucky to be able to live and work on this beautiful site, but suddenly the oak woodlands that once held much joy for me all just looked like fuel. It was clear that the homes that we lived in were at significant risk and difficult decisions were made about what items should be loaded into the car and what we must drive away from – not knowing if we would return to find them intact. While residents on site prepared to evacuate, other HREC staff were making decisions about the many lives that depended on them for their wellbeing, the flock of 500 sheep and their accompanying 6 guardian dogs and 1 sheepdog. Shepherd Jim Lewers was quick to consider the safest space for the flock and they were herded swiftly downhill to the flat irrigated pasture at our lowest elevations. Our wonderful neighbors on the Poor Ranch were working hard to protect their homes and to consider how they might also link with efforts to save HREC homes. As the sun set, the fire looked more daunting to all, HREC residents had left the site, but a few staff stayed on to do what they could as they waited for CalFire – who were stretched thin with numerous fires to attend to. My last phone conversation that evening with our interim director John Bailey was worrying.“I'm not feeling confident, the fire is headed downhill towards headquarters, is there anything else you need from your house?” he asked. Although I know of the huge benefits of fire to our lands, this fire was now encroaching on our homes and it was hard to consider any positive role it might have. At around 9 p.m., CalFire moved their incident command to HREC alongside a team of at least 3 bulldozers, a water tanker and 6 engines. It's hard to express the gratitude you feel to these men and women who will put themselves at such risk to save the homes of strangers. This was certainly a turning point for HREC, all buildings and animals were kept safe although around two-thirds of the site did burn above headquarters and spread east towards Lake County. Although the fear for headquarters could dissipate – it was with grim understanding that now others were at risk and this fire was still burning strong. As I write this, a few days on, we are now assessing the damage to the site. Our water supply is severely affected, pipes that carried water from springs on site simply burst as the water inside them boiled due to the heat. Our team is out checking for dangerous trees, which still smoke ominously along the road. The many research projects that used our site as their “living laboratory” are impacted to various extents. And yet – we know how lucky we are.  On our minds are all the people facing evacuation and the potential loss of their homes or worse. The role of HREC in sharing advice on fire safe measures alongside the Mendocino Fire Safe Council becomes stronger and clearer. Now that the immediate fear has subsided, I can think again about the healing power that this fire will have on parts of our landscape. Many of our oaks did survive and prescribed burns over the years have aided in ensuring some parts of the site suffered only quick moving grass fires. Although the important wildlife research conducted by the UC Berkeley Brashares lab will be significantly impacted, we will now be able to see the movements of the many GPS collared deer that live on our site in relation to fire. This fire will offer many more opportunities for researchers from different fields to study post fire impacts with access to long-term pre-fire data to support their work. 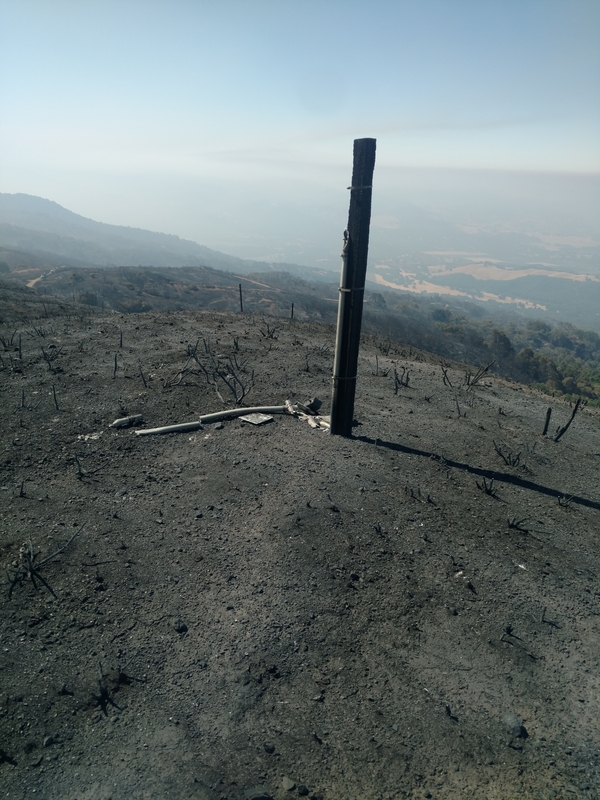 Our site is here to provide answers to scientific questions associated with a Northern California working landscape – and this fire has allowed us to gain knowledge, the opportunity to learn more and the impetus to share that knowledge to help where we can. This picture was taken on Friday night, July 27 as the fire started to move downhill towards the headquarters area. Research projects have been affected, for example this weather station was completely destroyed by the fire. On the positive side - there are now many opportunities to see the regenerative aspects of fire and the research associated with those. Looking across to Cow Mountain from the higher points on the site through the chaparral. 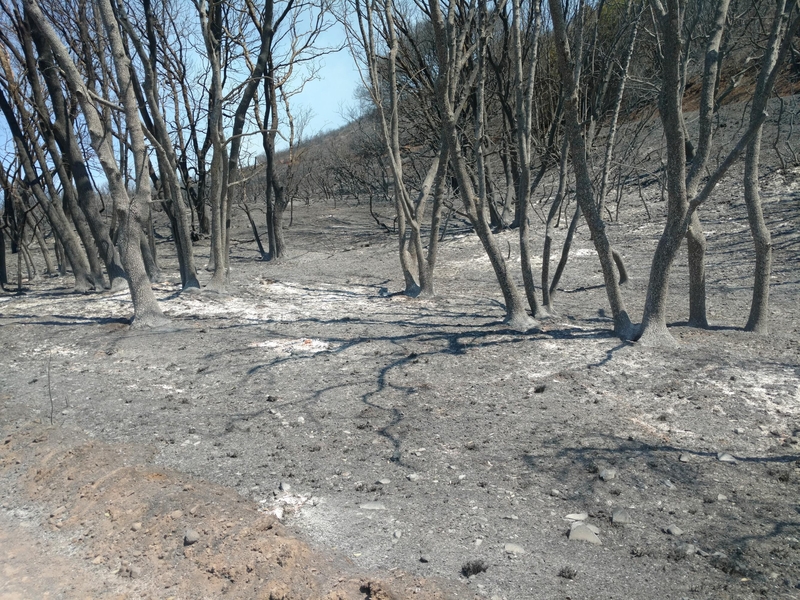 Many of our oaks have survived, past prescribed fires and grazing decreased the fuel load beneath the trees reducing the temperature and allowing fire to move through quickly. However in this are a mid story of madrone led to higher temperatures and prolonged burning which may have killed some of the black oaks to be found in the area.